Our Community's latest data science project combines two of our passions: grants and gender equity. We set out to find out whether an applicant's gender would affect the result of their application for funds. Women submit more grant applications than men. However, where a grant is very big ($1 million +), men are more likely to apply (though women are more likely than men to be successful in applications for large grants). The awarding of grants does not appear to be affected by an applicant's gender, with the exception of grants awarded by the group of grantmakers designated by SmartyGrants as 'State/Territory Government entities' which favour women. Whichever way you look at it, grants are women's business. At least 52% of the people that apply for grants are women, compared with 35% for men, SmartyGrants data reveals. And the people assessing the grants are most likely to be women as well (a 2015 analysis we undertook found that women outnumbered men as assessors by more than three to one). We're currently running our annual Grants in Australia survey, a survey for grantseekers. 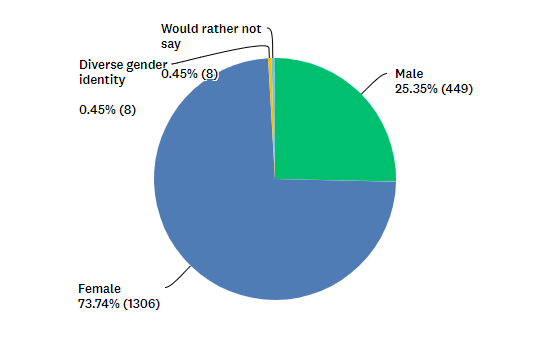 For the first time this year we've asked people completing the survey their gender. With around 1800 responses to date, our sample is heavily skewed towards women. Either many more women are applying for grants, or women are way more inclined to answer surveys. More than $4 billion is distributed in grants to charities across Australia each year, according to the Australian Charities and Not-for-profits Commission - that's big bikkies in anyone's language. There's a lot at stake if applications are subject to conscious or unconscious bias. With that in mind, we set to find out whether an applicant's gender was influencing the result; that is, we wanted to know, are female applicants more or less likely to get a grant? To find out, we dipped into the SmartyGrants database. SmartyGrants is Our Community's cloud-based grants management tool. It's used by around 260 government, philanthropic, corporate and community organisations to administer more than a billion dollars in funding per year. Well over 150,000 forms (mostly grants applications) are submitted through the platform each year. Our project involved inferring the gender of applicants, based on their honorific or their name, then comparing each group (women, men, unknown) to the outcome of their application - whether "successful" or "unsuccessful". We interrogated 405,188 applications submitted between 2013 and 2016. The good news is that we did not find a bias in the overall results - that is, the gender of an applicant does not seem to affect the outcome of a grant application. In general, the number of grants awarded to women or men was determined by the number of applications placed by women or men. Roughly 42% of the applicants were approved regardless of the applicant's gender. While women are over-represented as grant applicants, where a grant is very big that trend is reversed - our study found that applications requesting more than a million dollars are more likely to be submitted by men (49% for males and 36% for females). That bias does not flow through to approval rates, however. Our study found that women applying for grants of $1 million+ were more successful than men, with a 32% and 20% success rate respectively. We ran our analysis across each sector separately. The one exception we found to the general trend of gender equity in grant assessment was for those grantmakers classified by SmartyGrants as 'State/Territory Government Grantmakers,' which showed a gender bias in favour of women. Applications submitted by women were funded more often than applications submitted by men (34% vs 26%). We also wanted to see if there were variations to our findings from grantmaker to grantmaker. Our Community's data principles dictate that we only ever look at data in aggregate unless we have the express permission of the data owner. Accordingly, we sought permission from five SmartyGrants users to isolate their data and check for a gender bias. While the grantmakers recorded vastly different overall approval rates, none of the five grantmakers whose data we examined recorded a significant gender bias. Of course, just because we've eliminated a bias towards male or female grant applicants does not mean that grant application assessment is fair. Over the next 12 months we'll be doing some more analysis to try to determine if applications that are targeting a particular class of beneficiary (male versus female; particular ethnicities; particular age groups; etc.) are likely to be more successful. Where we do unearth a bias, we'll be looking to find out more about why it exists (it may be perfectly justified - an over-representation of a group that had greater need, for example). Our data science activities can only succeed when we have enough data to feed the machine. Please PLEASE use the CLASSIE standard taxonomy to categorise your grants if you can. CLASSIE subject and beneficiary standard fields can be easily dropped into your forms via the SmartyGrants Form Builder - contact us if you need help getting started. The quality and reliability of our analyses will also be vastly improved if you record your decisions in SmartyGrants and use the budget and funding allocation fields. We also have a range of "gender lens" standard fields available for use on your forms. Use of these fields will help you, and your grantees, become more gender aware. For a more detailed discussion of this issue, check out our paper below.